PI Miranda Steele knows something has been eating away at her teenage daughter for months now. Does Mackenzie know her real father was a psychotic serial killer? 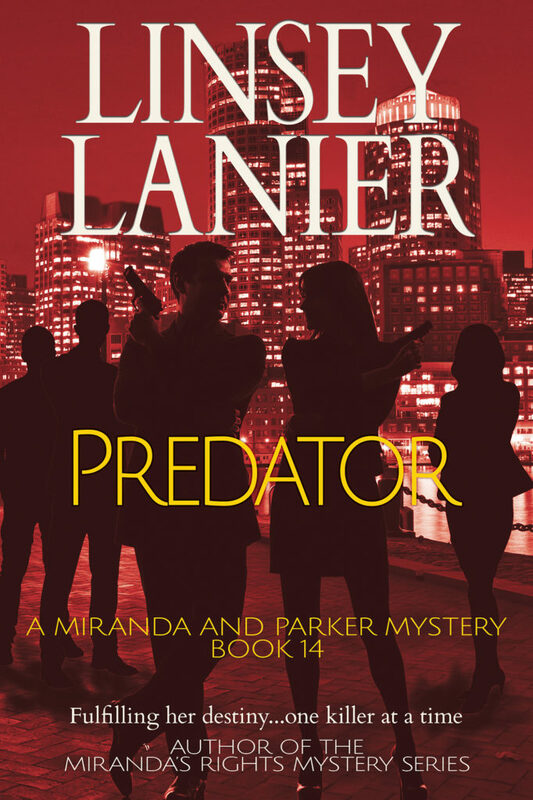 Miranda’s afraid to ask and this time, Parker has no answers. But when her precious daughter goes missing, Miranda goes into a tailspin. Now she’s forced to ask the most painful question of all. Has Mackenzie’s emotional state caused her to fall victim to a sexual predator? You’ll want to read this exciting, fast-paced thriller because it’s a story readers say they can’t put down. She plodded along the concrete walkway of the interstate bridge, head down, barely aware of the cars whizzing past her. She felt numb and yet she shivered a little in the chilly March wind. She’d worn too light of a jacket. Not that it would matter soon. Everyone has a time, her mother used to say. She’d been thinking about her mother a lot lately. The headaches brought on the memories. In her mind, she could see her mother stretched out on the old worn couch, dressed in the robe with the pretty blue flowers she used to wear, her hair a tangled mess. She could smell her breath. The odor made her sick, just like it used to. She hadn’t learned until much later it was the smell of alcohol. She’d been too young to recognize it then. But she could remember those words. Her mother had been talking about her father. And then one day she’d told her her father was dead. When she asked how that could be, all her mother had said was that it had been his time. “Everyone has a time,” she’d told her. The wind grew stronger as she reached the edge of the bridge where the railing stopped and the concrete barrier began. Her head pounding, she stared up at the chicken wire fence mounted high atop the ledge. She peeked over the barrier and saw a small concrete platform about five feet down. That would work. She blinked at the cars buzzing by down below the overpass. So many of them. All going so fast. Where were they heading? To soccer practice? To games? Shopping? It was the weekend. How nice it would be to know who you are and where you were going every day. And then there was that girl at school. The junior with the perfect brown hair. The words she’d said about her at lunch on Friday still burned in her heart. Even now, she could feel her cheeks reddened. She’d been so humiliated. The girl hadn’t been mean, exactly. Just superior. Far above her, anyway. That’s when she’d known she’d never be good enough. Not for her faceless father. Not for her drunken mother. Not for the kids at school. Not for anyone. She’d never ever be good enough. That’s when she knew it was her time. She took off her jacket and laid it over the rail. The wind whipped through her, rippling her lightweight short-sleeve top. Closing her eyes, she put her hands on the concrete and drew in its rough cold surface. Minutes went by. Her hair blew around her face as her brain swam with hurtful words from her past, from her mother, from the girl at school, from deep inside her own mind. She breathed in the cold air, searching for the courage for what had to be done. A shout made her open her eyes again. The cars down below were slowing. There must be a traffic jam up ahead. She thought she heard tires screech behind her. And a cry. But her head was so fuzzy with memories, she couldn’t make out anything. She turned and saw a police officer coming toward her. Talk? What was there to talk about? Nothing would change. Nothing would ever change. Again she peered over the railing. Cars were stopped in their lanes. Flashing lights came from a fire truck a few yards beyond the overpass. A group of firemen were assembling a large yellow inflatable thing just below her. It looked like a raft she’d been on at summer camp one year. They were trying to stop her. She slung a leg over the rail. Instead she held onto the rail, pulled her other leg over, and let herself drop down to the concrete platform. It was only about a foot wide. She had to be careful or she’d land in the trees. “Leave me alone.” Trying to position herself, she clung to the iron bar of the railing now over her head. The woman leaned over the rail and a strong hand gripped her arm. “I don’t mean to do that. I’m just here to help.” The woman kept on talking, but she couldn’t make out the words. She was in too much of a panic. She looked down. The men below were pointing up at her and moving the yellow raft thing so it would catch her. If she was going to do it, it had to be now. She pulled her arm away as hard as she could. The officer’s nails scraped her skin as she lost her grip. She lost her balance and fell backward. Her feet left the narrow platform. She tumbled down toward the pavement below. Down past the bare tree branches. Past the beams of the overpass. Past the stains on its concrete supports. Down, down, down. And into darkness. Previous PostVanishing Act now available in Kindle Unlimited!